Jar with sugar frosting. Add the coffee liqueur and flame, sprinkle cinnamon and waving back twice. On the other hand a flaming drink tequila with orange peel and flamed and add to jar. 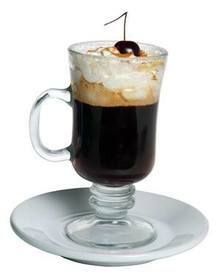 Mix and pour the hot coffee, adding the whipped cream, sprinkle with cinnamon.